The following resources are available to help spread the word about Proposition 47 and implementation. If you are seeking specific information about the record change process itself, please click here. For a listing of upcoming events, click here. 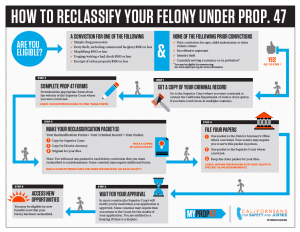 Proposition 47 Implementation Training Manual – This guide is geared towards local legal services organizations that are providing support to people embarking on the record change process under Prop. 47. Resources are also available in Spanish. Proposition 47 Outreach Materials – A variety of materials, including bilingual postcards, posters and door hangers are available for outreach efforts. To request a catalog of materials, contact Sybil at: sybil@behr-communications.com.